Chances are that you have a smartphone within a foot of you right now. How many times have you looked at its screen in the past hour? How likely are you to pick it up to scan the news, check emails and texts, and reply to incoming messages when you’re spending one on one time with your child? There’s good reason to put your phone and other mobile devices away when you’re with your children. Read on to find out how you can positively impact your child by reducing your time on the phone. Reduce Your Stress. Every time you pick up your phone, you’re likely to see emails, texts, and voicemails that have the ability to make you feel as if you need to respond right away, and may bring up issues and concerns that will increase your stress. In order to take some time away from the stresses of work when you’re with your kids, keep your phone in your pocket or bag. to face interactions with their adult caregivers. Before the days of smartphones and tablets, every chance to hold, snuggle, feed, or play with your infant would have involved far more opportunity to have a face to face interaction with your child, and children develop language and communication based on these interactions. Get Better Connected. Each time you pick up your phone, you emotionally check out, if only for a few minutes at a time. A few minutes may not seem like a long time to you, but to your child, every moment is significant, and your absence is felt. Putting away your phone lets you carry on prolonged emotional connections with your kids. Set a Good Example. Kids learn from adults how to conduct themselves around others. Eye contact, smiles, positive reinforcement, and good listening are all key takeaways that children learn from their interactions with us. 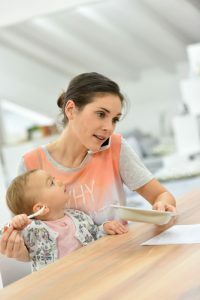 When you put your phone away, you’re showing your child that she is important to you, she is heard and understood, and you’re passing on that behavior so that she’ll exhibit it in the future. Keep Behavior in Check. Research has shown that when parents use their phones in front of their kids, they have a tendency to act out, either due to boredom, or due to frustration over a lack of attention from mom and dad. When you’re on the phone, you’re less likely to correct this behavior, which can lead to repeated behavior of a similar sort. We know how hard it is to ignore incoming calls and emails, texted photos and breaking news. Relying less on your phone will become easier with time, especially when you see the positive impact it has on your child!